Corsica ( French: Corsican and Italian: Corsica) is an island in the Mediterranean Sea belonging to France. It is located west of the Italian Peninsula, southeast of the French mainland, and north of the Italian island of Sardinia. Mountains make up two-thirds of the island, forming a single chain. After being ruled by the Republic of Genoa since 1284, Corsica was briefly an independent Corsican Republic from 1755 until its conquest by France in 1769. Due to Corsicas historical ties with the Italian peninsula, the island retains to this day many elements of Italian culture. The native Corsican language, whose northern variant is closely related with Tuscan, is recognised as a regional language by the French government. The French emperor Napoléon Bonaparte was born in 1769 in the Corsican capital of Ajaccio. His ancestral home, Casa Buonaparte, is today used as a museum. The origin of the name Corsica is subject to much debate and remains a mystery. To the Ancient Greeks it was known as Kalliste, Corsis, Cyrnos, Cernealis, or Cirné. The latter Greek names are based on the Phoenician word for peninsula (kir). It is 183 kilometres (114 mi) long at longest, 83 kilometres (52 mi) wide at widest, has 1,000 kilometres (620 mi) of coastline, more than 200 beaches, and is very mountainous, with Monte Cinto as the highest peak at 2,706 metres (8,878 ft) and 20 other summits of more than 2,000 metres (6,600 ft). Mountains comprise two-thirds of the island, forming a single chain. Forests make up 20% of the island. 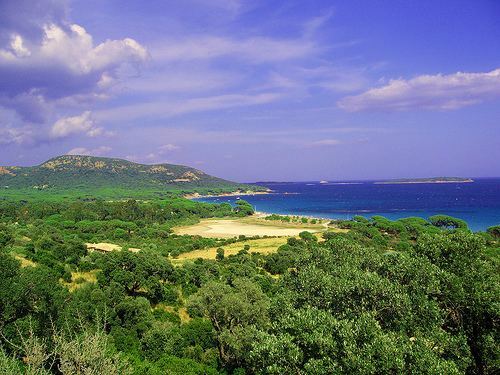 Approximately 3,500 km2 (1,400 sq mi) of the total surface area of 8,680 km2 (3,350 sq mi) is dedicated to nature reserves (Parc naturel régional de Corse), mainly in the interior. Corsica contains the GR20, one of Europes most notable hiking trails. The island is 90 kilometres (56 mi) from Tuscany in Italy and 170 kilometres (110 mi) from the Côte dAzur in France. It is separated from Sardinia to the south by the Strait of Bonifacio, a minimum of 11 kilometres (6.8 mi) wide. Corsica is one of the few French regions in which its own minority language has a better prospect of survival compared to the others: in fact, alongside French (Français), the most widely spoken language is Corsican (Corsu), which is closely related to medieval Tuscan (Toscano). However, since the annexation of the island by France in the 18th century, Corsican has been under heavy pressure from French, and today it is estimated that only 10% of Corsicas population speak the language natively, with only 50% having some sort of proficiency in it. It should also be noted that fewer and fewer people speak a Ligurian dialect, known as bunifazzinu, in what has long been a language island, Bonifacio. In Cargèse, a village established by Greek immigrants in the 17th century, Greek (????????) was the traditional language: whereas it has long disappeared from spoken conversation, ancient Greek is still the liturgical language and the village has many Greek Orthodox parishes. Corsica is the least economically developed region in Metropolitan France. Tourism plays a big part in the Corsican economy. The islands climate, mountains, and coastlines make it popular among tourists. The island has not had the same level of intensive development as other parts of the Mediterranean and is thus mainly unspoiled. Tourism is particularly concentrated in the area around Porto-Vecchio and Bonifacio in the south of the island and Calvi in the northwest. From the mountains to the plains and sea, many ingredients play a role. Game such as wild boar (Cingale, Singhjari) is popular. There also is seafood and river fish such as trout. Delicacies such as figatellu (also named as ficateddu), made with liver, coppa, ham (prizuttu), lonzu are made from Corsican pork (porcu nustrale). Characteristic among the cheeses is brocciu (similar to ricotta), which-when fresh-is used as ingredient in many dishes, from first courses (sturzapreti) to cakes (fiadone). Other cheeses, like casgiu merzu, casgiu veghju are made from goat or sheep milk. Chestnuts are the main ingredient in the making of pulenta castagnina and cakes (falculelle). A variety of alcohol also exists ranging from aquavita (brandy), red and white Corsican wines (Vinu Corsu), muscat wine (plain or sparkling), and the famous "Cap Corse" apéritif produced by Mattei. The herbs which are part of Maquis (Corsican: ) and the chestnuts and oak nuts of the Corsican forests are eaten by local animals, resulting in the noticeable taste in the food there. The cuisine of Corsica is the traditional cuisine of the French island of Corsica. It is mainly based on the products of the island, and due to historical and geographical reasons has much in common with the Italian cuisine, and marginally with those of Nice and of Provence. The geographic conformation of Corsica, with its eastern coast (the one nearest to the continent) low, malaria-ridden and impossible to defend, forced the population to settle in the mountains of the interior. The agricultural products exported during Antiquity reflect this situation: these were sheep, plus honey, wax and tar, produced by the widespread forests. Moreover, the island was famous for its cheap wines, exported to Rome. The concentration of settlement in the interior, typical also of the nearby Sardinia, lasted until the beginning of the 20th century: in 1911, 73,000 inhabitants lived in the zone comprised between 700 and 1,000 m above sea level. In the Middle Ages, and more precisely during the 12th century, when Pisa was Corsicas hegemonic power, the large immigration from nearby Tuscany brought to the island, together with the Tuscan language, customs and dishes typical of that Italian region. Later, when it was the turn of Genoa to dominate the island, a major shift in peoples eating habits took place: the Genoese governor, with a decree signed on 28 August 1548, ordered that each landowner and tenant had to plant at least a chestnut, a mulberry, an olive and a fig tree each year, under the fine of three lire for each tree not planted. Other decrees on the same line, such as that issued in 1619, which ordered that ten chestnut trees had to be planted every year by each landowner and tenant, with time changed radically the landscape of whole regions of the island, with the almost total substitution of cereals with chestnuts: one region, the Castagniccia, south of Bastia, got its name from its chestnut (castagnu) forests. In the 18th century the chestnut had almost completely replaced cereals. Above all chestnut plantations radically changed the diet of the islanders, preserving them from the recurrent famines. An old Corsican proverb from upper Niolo asserts: "Pane di legnu e vinu di petra" (English: Wooden bread and stoney wine), explaining well the central place occupied by the chestnut in Corsicas alimentation (and the frugality of Corsican mountaineers, obliged to drink water instead of wine).